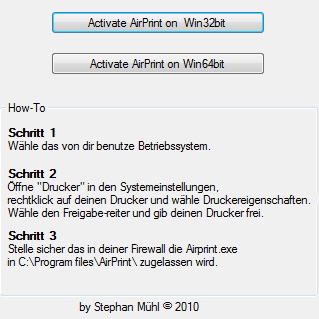 Some enterpreneur German wrote a small windows application to easily activate AirPrint on Windows for free… You can grab a copy here. Sorry, it is in German. There a numerous report of the application not working properly… try at your own risk. Good to see that there is now hope for Windows users to get AirPrint working on their PC. Does Windows 7 reduce netbook battery life?